An import line with fantastic performance and excellent prices that is so widely accepted now that few new shooters know it as an import, but rather as a mainstay of the shooting landscape. 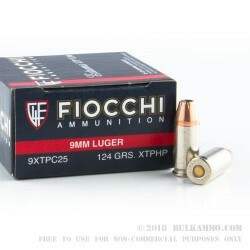 The Fiocchi 9mm Luger ammo in 124 grains is loaded an XTPHP projectile making it a potent self-defense round with a cheap price point. 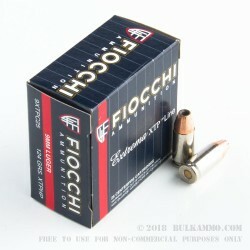 At this price, it’s quite attractive to use at the range and competitive with reloaded ammunition on price. The sophisticated design aspects and the quality of manufacture far outweigh the price point and the humble packaging produced by Fiocchi. 124 grains of Hornady XTP performance projectile moves out of the muzzle at 1100 feet per second, and achieves 300 ft, lbs. of energy with a projectile that has excellent penetration given the numerous independent gelatin tests (more than 14” generally). 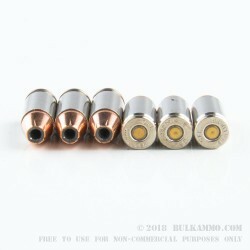 This round is perfect for bulk shooters that want a single cartridge for all they do in 9mm. The price point eliminates concern for paying too much for performance, as it already observes a top tier performance position with a moderate to lower entry price. The reloadable nickel plated brass case is Boxer primed for easy reloading and consistent performance in the functionality of the firearms for which it is suited, which, by the way, is any 9mm firearm in the mainstream segment of the market.